US #3431 – The first self-adhesive stamp in the Distinguished Americans series. On January 12, 1932, Hattie Caraway became the first women elected to serve in the United States Senate. Born in Bakerville, Tennessee, on February 1, 1878, Hattie Wyatt earned a Bachelor of Arts degree from Dickson (Tennessee) Normal College in 1896. She taught school for a few years before marrying Thaddeus Caraway in 1902. After they were married, the Caraways moved to Jonesboro, Arkansas, where Thaddeus opened a legal practice and Hattie raised their three children and oversaw their cotton farm. Thaddeus entered politics in 1912, serving in the House of Representatives. He was then made a US Senator in 1921. US #3432 is similar to #3431 but is die cut 11 ½ x 11. Thaddeus died unexpectedly on November 6, 1931. At that time, it wasn’t unusual for widows to temporarily fill their husband’s seats. So Hattie was sworn in as a temporary US Senator on December 9, 1931. A month later, the Senate held a special election on January 12, 1932. In that election, Hattie claimed victory with 92 percent of the vote over the other two independent candidates. Hattie’s victory then inspired the creation of the Arkansas Women’s Democratic Club, which helped raise money for her next campaign and encouraged women to vote. 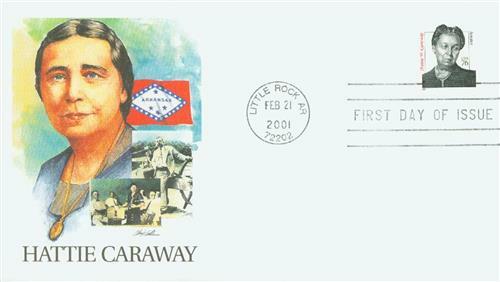 US #3431 – Fleetwood First Day Cover. 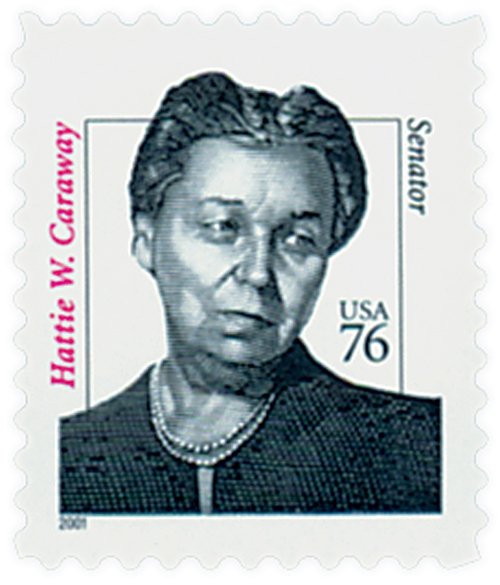 Hattie then tirelessly campaigned throughout Arkansas, with the support of Louisiana Senator Huey Long. Together they traveled over 2,000 miles and gave 39 joint speeches before 200,000 people. In the Democratic primary that August, Hattie won 61 of the state’s 71 counties and 44 percent of the vote against six men. And in the election that fall, she beat her Republican rival by a nine-to-one margin. US #3431 – Silk Cachet Combination First Day Cover. In the Senate, she was known as “Silent Hattie,” speaking on the floor just 15 times during her 14-year career. She once said that she didn’t like to make speeches and that “I haven’t the heart to take a minute away from the men. The poor dears love it so.” Hattie frequently supported President Franklin Roosevelt and his New Deal reforms, especially when it came to farming relief and flood control. Hattie helped to secure $15 million to build an aluminum plant and got federal funding for an Arkansas college. Hattie continued to add several “firsts” to her resume – she was the first woman to chair the Enrolled Bills Committee, the first woman to ever chair a Senate committee, the first woman to preside over the Senate, the first senior woman Senator, and the first to run a Senate hearing. US #3431 – Classic First Day Cover. 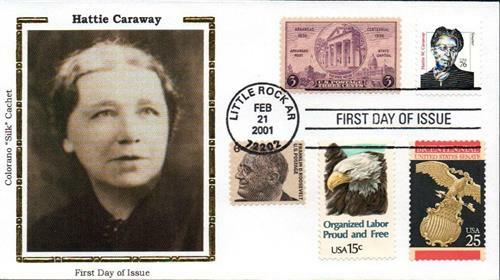 Caraway stood as a representative of the people for several years but was eventually defeated in her re-election bid in 1944. After that, President Roosevelt appointed her to the Employees’ Compensation Commission. President Harry Truman later gave her a post on the Employees’ Compensation Appeals Board. It was while serving there that she suffered a stroke in January 1950, and died on December 21 of that year. 6 Responses to "This Day in History… January 12, 1932"
Now more congresswomen are at Washington DC at US Capital as freshmen for 116th. This article is very interesting about 1st woman elected to the US Senate in the 1931 after her husband passed away in 1931. She was appointed in 1931 to fill the vacancy caused by the death of her husband, U.S. Senator Thaddeus Caraway. 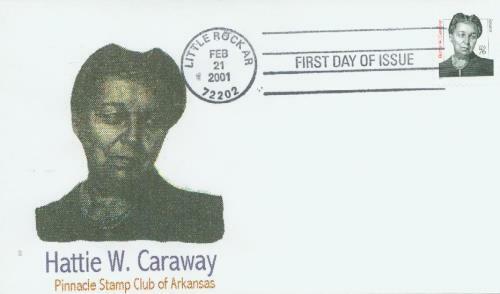 Ms. Caraway then sought and won election on her own in 1932.